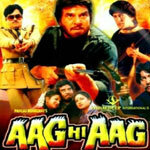 "Aag Hi Aag" is a 1988 hindi film which has Dharmendra, Moushmi Chatterjee, Chunky Pandey, Shatrughan Sinha, Gulshan Grover, Shakti Kapoor, Danny Denzongpa, Richa, Vinod Mehra, Neelam Kothari, Tej Sapru, Mac Mohan, Ghanshyam, Pinchoo Kapoor, Satish Kaul, Yunus Parvez, Jagdish Raaj, Om Shiv Puri, Gita Siddharth and Anirudh Agarwal in lead roles. We have 4 songs lyrics and 4 video songs of Aag Hi Aag. Bappi Lahiri has composed its music. Shabbir Kumar, Shailendra Singh, Meghna Oberoi, Lata Mangeshkar and Asha Bhosle have sung these songs while Anjaan has penned its lyrics.